I’ve been on a huge sandwich kick lately. I’m not just talking about fancy gourmet sandwiches, either. I took a PB&J sandwich to work for lunch TWICE last week. Weird, at least for me. And don’t get me started on grilled cheeses. Lately all I want to do is fry up some carbs with a blanket of cheese in between. It’s bad news. The cold weather has me craving the comfort food of my childhood non-stop. The other day I decided to make something a little more…sophisticated. It included crusty rolls, savory pesto, two cheeses and roasted red peppers. It tasted like something I’d order from a restaurant and that toasty, cheesy bread zapped my grilled cheese craving. Well, that day anyway. Preheat oven to 425 degrees. Spread the sliced red pepper on a large baking sheet lined with parchment and drizzle with 1 tsp. olive oil. Roast for 20 minutes or until starting to blacken at the edges. While the peppers roast, put a medium skillet over medium heat on the stovetop. Put 1 tbsp. olive oil in the skillet. Pound your chicken breasts to tenderize and thin them out a bit. Season with salt & pepper and fry them in the pan until cooked through and golden brown. While the chicken is cooking, cut your buns in half. Spread each bun half with 1 tbsp. of pesto (or a little less depending on your taste). Once chicken is cooked, let it stand for a few minutes, then slice into strips. Once peppers are done roasting put them on a plate. Place the pesto buns on the same baking sheet and lay the roasted peppers and red onions on 4 of the bun halves, then sprinkle each of those 4 with ¼ cup mozzarella cheese. On the other 4 bun halves, sprinkle 1 tbsp. 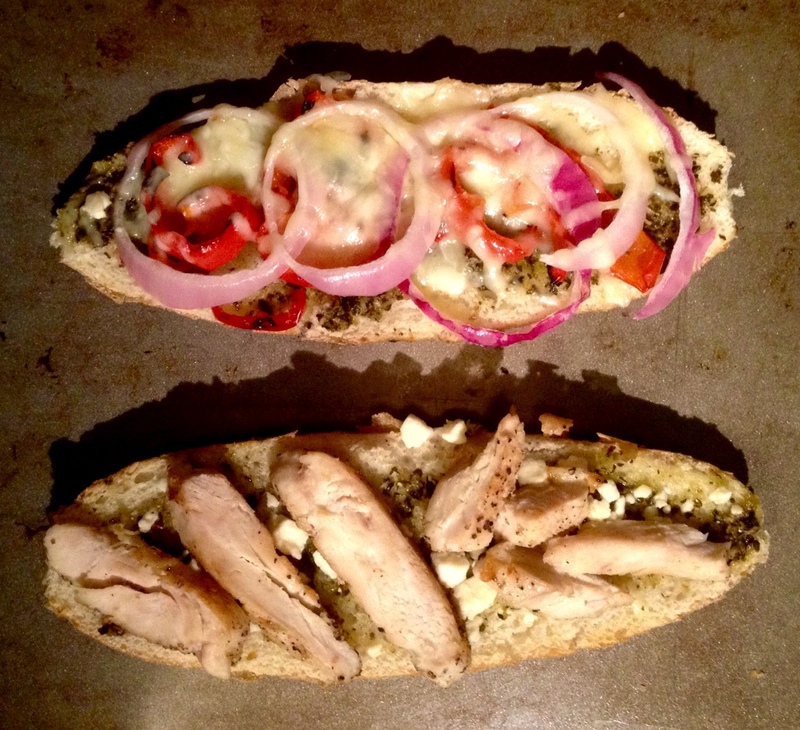 crumbled feta, then divide the cooked chicken breast slices evenly between those 4 bun halves, on top of the feta. Put the pan back into the hot oven and bake for 5 minutes or so, then broil for 1 minute. Take the pan out of the oven and let the sandwiches rest for a minute or two, then place each red pepper covered bun half on top of a chicken covered bun half. Cut sandwiches in half and devour.